halves are placed together and held in position by two screwed-on end battens. take can be corrected by either glueing in pieces of strong brown paper, where too much wood has been removed, or, if the mis�take is more serious, a thin piece of veneer can be glued in; tapering it off at the ends which are then glasspapered down. It cannot be too strongly stressed that the labour and time spent on producing a good mould is not wasted. It is most important that the finished mould should be perfect� the perfect guitar cannot be constructed on a mould that is not one-hundred-per-cent. perfect. On the opposite page is shown the various woods advised for the main parts of the guitar but it may be necessary for the ama�teur to compromise, as the ideal woods may not always be obtainable. The important thing is to choose the right kinds of wood, i.e. hardwood for the back and sides; spruce or pine for the face, etc. Having prepared the mould to your com�plete satisfaction, the first job to be tackled is the making of the sides of the guitar. Two pieces of rosewood, walnut, maho�gany, maple or sycamore, each 31/2" wide by 30" long and just over 3/32" thick, are needed for making the sides of the guitar. These pieces of wood should be planed per�fectly smooth on both sides without reducing the material to less than 1/16" thick. 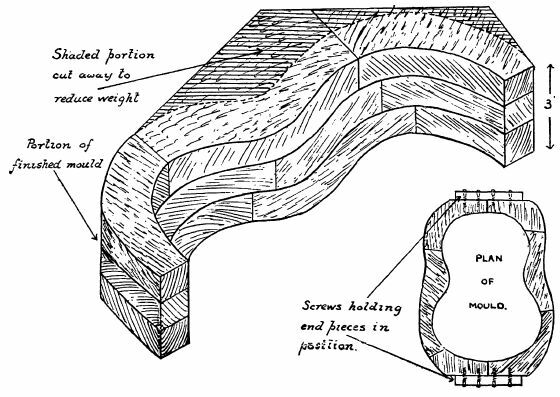 To "shape" the sides before inserting them into the mould it is necessary to use a " bending iron " and details of construction are shown in Fig. 3. Although gas heating is advised (for this can be more easily controlled) electric heating can be used�1 kw. element being sufficient. If electrical heating is used, care should be taken to see that all connection are properly earthed.